BPM is the visualization, creation and update of executable business processes using graphical symbols. BPM is required whenever there are complex processes that change rapidly. BPM is applied within business areas. BPM is a mainstream technologies that is used by large organizations to understand, manage and control costs of business processes. Semantisys BPM applies Semantic technologies to automatically discover and transform enterprise business functions and data to integrate into executable processes. Business Process Management or BPM is a both a software technology and management paradigm for the control of business processes. BPM is the 21st century successor to the 1980s workflow technology. 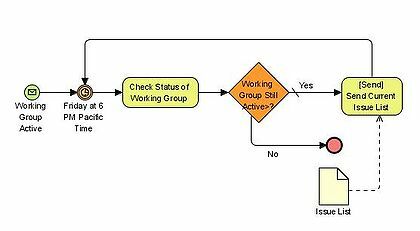 Like workflow, BPM provides Microsoft Visio� like graphical screens used to pictorially flowchart and diagram a process. With a push of a button, the diagram is then automatically converted into a running business process. Unlike the older workflow technologies, BPM can easily incorporate integration of human tasks into the process diagram. BPM software is now becoming standardized so that a BPM diagram created on one tool can execute on any tool. Business Process Management Notation (BPMN) is emerging as the most widely used BPM notation. The notation is an IBM collection of flow charting symbols that represent events in the BPM process. In addition, BPM is generally SOA or Service Oriented Architecture enabled such that any functionality that is exposed as a web service within other systems can be included in the BPM process. Semantisys specializes in Business Process Management using Business Process Management Notation (BPMN) and the Six Sigma methodology for process metrics.